Singapore Emulsion Fuel Pte Ltd (SgEF), an innovative player in the green energy space, today announced the opening of Asia's first clear nano-emulsion diesel plant. Ursataur Capital Management L.P. and BASF Venture Capital GmbH invest in Quantiam Technologies Inc.
Quantiam develops and commercializes disruptive, world-first new products based on advanced materials, catalysts, coatings and surfaces for extreme-operating environments and energy-related applications. Flynn's technology is based on magnetic nano particles injected into the body. The particles carry antibodies that bind with cancer cells to pinpoint the exact location of diseases, both for diagnostics and for targeted therapies. RUSNANO and Elecard Group of Tomsk, Russia will produce various electronic units using multimedia processors with technical norms of 90 nanometers to 65 nanometers. The project addresses goals set forth by President of Russia Dmitry Medvedev to make digital television available to the entire country within the next five years. Ultratech, Inc., a leading supplier of lithography and laser-processing systems used to manufacture semiconductor devices, today announced that it has received a follow-on, multiple-system order for its laser spike anneal (LSA) tools from a major foundry in Asia. SEMATECH, a global consortium of chipmakers, and Dow Electronic Materials announced today that Dow has joined SEMATECH's Resist Materials and Development Center (RMDC) at the College of Nanoscale Science and Engineering (CNSE) of the University at Albany. Scientists at Michelman, Inc., a global supplier of water-based surface modifiers, polymers and coatings, are using a rotational rheometer from Malvern Instruments to tailor products for the exacting demands of the company's diverse customer base. In a deal that will generate economical new process options for the 3D integration market, Alchimer S.A., a provider of nanometric deposition technology for semiconductor interconnects and through-silicon vias, and KPM Tech Co. Ltd., a manufacturer of plating materials and systems, today announced a multi-level collaboration that gives KPM Tech exclusive rights to produce chemicals in Korea for Alchimer's technology. LayTec has now developed the ultimate temperature calibration tool for its EpiTT, EpiTwinTT and EpiCurveTT tools: the AbsoluT. 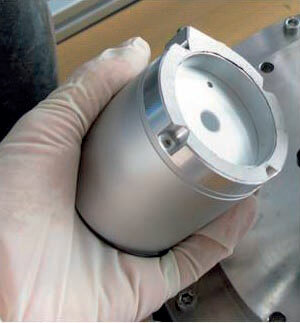 The new instrument is designed for on-site use in AIXTRON Planetary and CRIUS reactors. It performs temperature calibration inside the MOCVD chamber through the original viewport without any sophisticated alignment and with unrivaled accuracy. Advanced Diamond Technologies (ADT) is making broadly available an etch recipe which enables engineers and product developers to reliably and affordably design micro devices and sensors out of diamond. Elliot Scientific opens up exciting new capabilities for researchers and manufacturers in the UK and Ireland with the introduction of two products from CRAIC Technologies of San Dimas, California. Sterlitech Corporation, one of the largest producers of bench scale equipment for flat sheet membranes used in research and development labs throughout the globe, is pleased to announce the addition of Toray Membranes to its line of flat sheet products. Micronics, Inc. today announced that it has been issued a second letters patent from the United States Patent and Trademark Office (USPTO) for an integrated heat exchange system on a disposable, plastic cartridge. The new patent has broad utility across the life sciences sector with particular application in point of care molecular diagnostics. Acquisition extends Synopsys' virtual prototyping solutions into automotive and consumer applications. Leica Microsystems introduces a software tool for 24 hour remote monitoring of complex lab equipment.